NOTIFICATION: Haryana Staff Selection Commission (HSSC), Panchkula (Haryana) inviting online applications for filling up 978 vacant posts of Group D for various Departments, Boards and Corporations from eligible and interested willing candidates. It is latest & good information for unemployed personnel those who are looking for these new Jobs in Government sector & other organizations. Job seekers, who wish to apply for these vacancies regarding HSSC Recruitment 2019, must have passed 10th/Matriculation with Hindi/Sanskrit up to Matric Standard with relevant experience. Applicant’s upper age should be as per Govt. rules and age relaxation is applicable to all reserved category candidates i.e.SC/ST /OBC /Ex Servicemen /Women candidates etc. NO OF VACANCIES: 978 vacant posts of Group D through Haryana Staff Selection Commission (HSSC), Panchkula. EDUCATIONAL QUALIFICATION: A passed of Matriculation from any recognized board and Hindi/Sanskrit upto Matriculation, as one of the subject. AGE LIMIT: Candidate’s required age should be in between of 18 years – 42 years as on closing date for Apply Online HSSC Group D Recruitment 2019 for 978 Posts. PAY SCALE: Rs. 16900-53500/-+ applicable Special pay. REQUIRED APPLICATION FEE: For said vacancy a non- refundable application fee is to be paid by the candidates as per rules. Fee for Gen (Male) is Rs.100/‐ for Female of Haryana is Rs.50/- and for SC/BC/EBPG candidates of Haryana State only Male Rs.25/- Female of Haryana. Application Fee of is to be paid by the candidates through ONLINE MODE & E-Challan in any branch of State Bank of India & Punjab National Bank etc up to 25-04-2019. INQUIRIES: In case of any guidance/information/clarification regarding the online filling of the application form and Advertisement the candidate can call at helpline No. 01725143700 on all working days from 9:00 A.M. to 5:00 P.M.
इलाहाबाद बैंक ने 92 विभिन्न विशेषज्ञ अधिकारी के पदों की भर्ती हेतु आवेदन आमंत्रित किए हैं इच्छुक, योग्य एवं अनुभवी उम्मीदवार यहाँ से आवेदन कर सकते हैं। आवेदन पूर्व सभी आवश्यक जानकारी यहाँ अवश्य पढ़ें। 92 vacant posts of Specialist Officers of Security Officer, Civil Engineer, Financial Analyst and Managers in various disciplines in Allahabad Bank. LAST DATE TO APPLY: 29-04-2019. 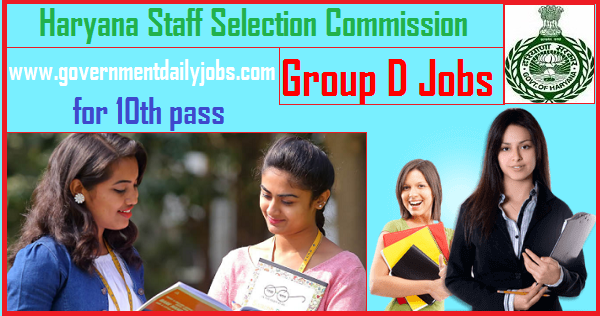 HOW TO APPLY: For said posts (HSSC Group D Recruitment 2019 Apply Online for 978 Group D Jobs) eligible, willing and interested candidates may apply through online mode at official website up to last date. Applicants must retain a hard copy for future reference. 2. Now check Advertisement for Advt. No 04/2019 vacancies. 4. Now, click on Online application for HSSC Group D Recruitment 2019. CONCLUSION: Haryana Staff Selection Commission (HSSC), Panchkula invites online application for the recruitment of 978 vacant posts of Group D on regular basis from Indian residents who are eligible & interested; candidates can apply through online application. LAST DATE TO APPLY: 22-04-2019 for HSSC Recruitment 2019 Notification of 978 Group D Posts.